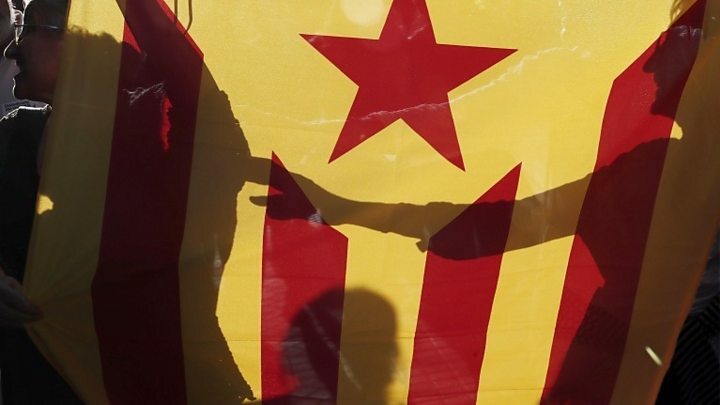 Catalonia's leader said the region's parliament would vote on independence if Spain continued "repression". A referendum outlawed by Spain was held earlier this month. Of the 43% who voted, 90% were in favour of independence. 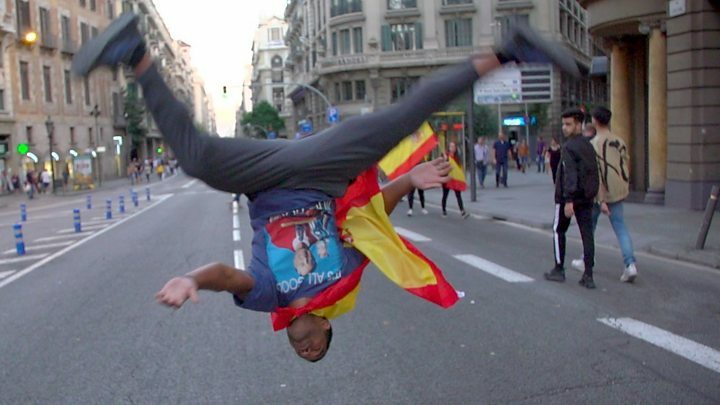 Political rhetoric aside, both the Spanish government and Catalan regional leaders know sentiments are running so high across Spain at the moment, that millions are poised to take to the streets. Once the shopping list of measures has been decided, the Catalan leader has the right of reply and we're told there is no legal window of opportunity for him to do so, meaning this could take days or weeks. Spanish Prime Minister Mariano Rajoy had set a deadline of 10:00 local time (08:00 GMT) for Catalan leader Carles Puigdemont to offer a definitive answer on the independence question, and called on him to "act sensibly". When it passed, the Spanish government accused the Catalan authorities of seeking confrontation. "The Spanish government will continue with the procedures outlined in Article 155 of the Constitution to restore legality in Catalonia's self-government," it said. "It denounces the attitude maintained by those in charge of the Generalitat [Catalan government] to seek, deliberately and systematically, institutional confrontation despite the serious damage that is being caused to the coexistence and the economic structure of Catalonia. "No-one doubts that the Spanish government will do all it can to restore the constitutional order." Mr Rajoy is currently attending an EU summit in Brussels. The president of the European Council, Donald Tusk, says there is no space for any international mediation or EU action on the Catalan crisis - though he did say there was "no hiding that the situation in Spain is concerning". On Saturday the government will be expected to draw up a list of specific measures under Article 155 of the constitution, launching the transfer of powers from Catalonia to Madrid. The article says: "If a self-governing community does not fulfil the obligations imposed upon it by the constitution or other laws, or acts in a way that is seriously prejudicial to the general interest of Spain, the government... may... take all measures necessary to compel the community to meet said obligations, or to protect the above-mentioned general interest." It is thought the measures implemented could range from taking control of the regional police and finances to calling a snap election. And Xavier Arbós, a constitutional expert at the University of Barcelona, said the situation was moving into "uncharted territory". He told the BBC: "We simply do not know what measures the Spanish government could enact. We do not know how the powers of the Catalan government could be affected." Mr Puigdemont said in a letter to Mr Rajoy on Thursday morning that the independence declaration remained suspended but this could change. "If the government continues to impede dialogue and continues with the repression, the Catalan parliament could proceed, if it is considered opportune, to vote on a formal declaration of independence." 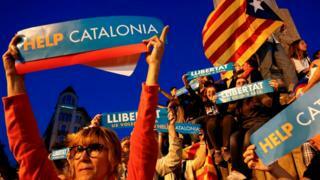 But he faces an uphill struggle - it is likely that senior figures in charge of internal security in Catalonia could be dismissed, and control of the region's police force could pass to Madrid. The regional parliament could also be dissolved. Image caption Tough choices: How will Carles Puigdemont (L) answer Mariano Rajoy's ultimatum? One Spanish newspaper has reported that Mr Puigdemont might nominally remain in his job but Madrid would aim to take control of many of his duties and powers. Ultimately the process could end in regional elections but the Spanish constitution does not impose any time limit.